For the Canon of Windsor, see John Hallam (priest). John William Francis Hallam (28 October 1941 – 14 November 2006) was a British character actor, who was well known in the United Kingdom for playing hard men or military types. John Hallam was born, the son of a superintendent at London Docklands, in 1941 in Lisburn, County Antrim, after the family were evacuated to Northern Ireland during the Second World War. On returning to England, he boarded at St Albans School, before starting his working life in a London bank. Despite having a talent for mathematics, he said he was sacked for getting the figures right without being able to explain how he did so. As a result, he ended up selling deckchairs on the South Coast, where he eventually found acting work in repertory theatre. After training at RADA (1962-64), Hallam began acting with Laurence Olivier's embryonic National Theatre Company, playing the Stage Door Keeper in Trelawny of the 'Wells' (Old Vic Theatre, 1965). He was seen performing on television for the first time in 1967, in the small role of a watchman when the BBC screened the director Franco Zeffirelli's National Theatre production of Much Ado About Nothing (Old Vic). Stage roles became infrequent when an unending flow of film and television work followed. On the big screen, he worked his way up from bit-parts as an officer in The Charge of the Light Brigade (directed by Tony Richardson, 1968) and a revolting Burpa tribesman in Carry On Up the Khyber (1968) to more substantial roles as Sir Meles of Bohemia in A Walk with Love and Death (the director John Huston's tale of 14th-century romance in France, 1969). Over the years he appeared in many films including Where's Jack? (1969), The Last Valley, Villain, Nicholas and Alexandra, Murphy's War, Quest for Love (1971), The Offence, Antony and Cleopatra (1972), Hennessy (1975), Trial by Combat (1976), The Four Feathers (1978), Love and Bullets (1979), Flash Gordon (1980), Dragonslayer (1981), Ivanhoe (1982), Santa Claus: The Movie (1985), When the Whales Came (1989), and the 1985 science-fiction cult film Lifeforce, directed by Tobe Hooper. He also appeared as McTaggart in the director's cut of the 1973 film The Wicker Man. His later film roles included a Baron in Robin Hood: Prince of Thieves (1991) and as Mandara in Kull the Conqueror (1997). In 1973 he played the troubled Dr. Peter Conway in the science fiction series Moonbase 3, but his most notable television role was as Thomas Mallen in the drama series The Mallens (1979). He also appeared in the BBC's television adaptations of two tales from The Chronicles of Narnia: Prince Caspian and The Voyage of the Dawn Treader, from 1988 until 1990, and later starred as Ali Ben Hassad in the 1998 TV movie The Incredible Adventures of Marco Polo. He also appeared in the show Blackadder (1983 Season 1, Episode 6: The Black Seal) as Sir Wilfred Death. He had a semi-regular role in the BBC soap opera EastEnders, playing prison inmate Barnsey Barnes, a character that appears as the cellmate of regular character Den Watts (Leslie Grantham) while he is serving time at the fictional Dickens Hill prison. Hallam appeared on the show between 1988 and 1989. In 1989 he appeared in the Doctor Who serial "Ghost Light" appearing as the memorable alien "Light". Hallam married theatrical mask-maker Vicky Brinkworth in 1966, and they had four children together, but divorced in 1992 after twenty-six years of marriage. Hallam was a cousin of actor Clive Mantle, who is best known for playing Mike Barrett in Casualty during the 1990s. 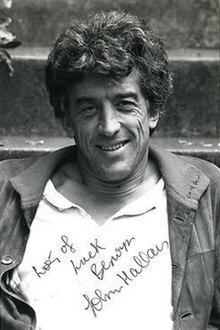 On 14 November 2006, Hallam died of testicular cancer in Clifton, Oxfordshire, England at the age of 65 after battling the illness for six months. ^ "The Mausoleum Club British Archive Television Forum". Archived from the original on 27 September 2007. Retrieved 19 November 2006. ^ a b c d "John Hallam". BFI. ^ a b c d e "Archived copy Independent obit". Archived from the original on 14 April 2016. Retrieved 2010-12-28. ^ a b "John Hallam". www.newulsterbiography.co.uk. ^ "Production of Trelawny of the Wells - Theatricalia". theatricalia.com. ^ "Production of Much Ado About Nothing - Theatricalia". theatricalia.com. ^ "Much Ado about Nothing (1967)". BFI. ^ "John Hallam - Movies and Filmography". AllMovie. ^ Jones, Stephen (4 August 2011). "The Mammoth Book of Best New Horror 18". Little, Brown Book Group – via Google Books. ^ "Marco Polo - TV Guide". TVGuide.com. ^ "Black Adder: The Black Seal (1983) - Martin Shardlow - Synopsis, Characteristics, Moods, Themes and Related". AllMovie. ^ a b Stage, The (24 November 2006). "John Hallam - Obituaries". ^ "BBC - Doctor Who Classic Episode Guide - Ghost Light - Details". www.bbc.co.uk.